If you are looking for some fun polka dot ideas for your baby shower, take a look at this adorable polka dot diaper cake submitted by Amber! The curly ribbon she uses is delightful! Amber is continuing to "pay it forward" like all of our other readers who have submitted and shared their fabulous diaper cake ideas. 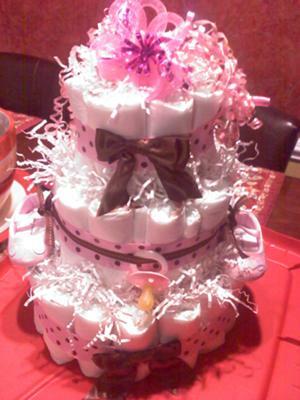 Our diaper cake gallery is loaded with all of our readers diaper cakes and we are happy to add Amber's diaper cake to our site. Thanks so much Amber, your cake turned out wonderful! If you have a diaper cake to share with us please submit it by following the link at the bottom of this page. Size 1 diapers, rolled up, and tied with a rubberband. 3 tier held together with a bottle of baby powder and Johnsons baby wash, neither of which can be seen. Pink and brown polka dot ribbon with the middle layer having a thin stripe of brown overlayed. Accented with newborn baby shoes, pacifiers, rattle toys, and brown satin bows.